An acute or chronic septicaemic disease caused by Riemerella anatipestifer, syn Pasteurella, or Moraxella a. It affects ducks of any age, sometimes turkeys, and may also be isolated from chickens, game birds and wild waterfowl. Mortality is 2-75% in young ducks. Transmission is mainly direct, bird-to-bird, via toenail scratches, especially of the duckling foot, or through respiratory epithelium during respiratory disease. It can also be by faecal contamination of feed, water or the environment where survival of the infectious agent may be prolonged. Adverse environmental conditions and pre-existing disease are predisposing factors. Perihepatitis without much smell or liver damage. Chronic arthritis, sometimes with erosions of the joint cartilage. Lesions, isolation and identification of organism - blood or chocolate agar in candle jar or 5% CO2. Differentiate from duck viral enteritis, duck viral hepatitis, fowl cholera, colibacillosis, coccidiosis, chlamydiosis. Sulphonamides and potentiated sulphonamides are the products most commonly recommended for drinking water application. Subcutaneous injections of penicillin + dihydrostreptomycin, or streptomycin + dihydrostreptomycin are also highly effective. Good husbandry and hygiene, rigid depopulation and disinfection, adequate protection, 'hardening off', correct house relative humidity, sulphonamides in feed. Inactivated and attenuated vaccines available in some countries. Autogenous bacterins sometimes used. Figure 40. 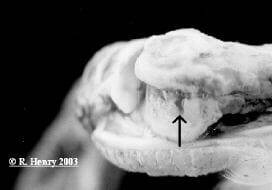 Erosions of the cartilage of the hock joint in a duck with chronic Riemerella anatipestifer infection.